Another major currency pair, the USD/CAD is cross between the currency of the USA (U.S Dollar) and the currency of Canada (Canadian Dollar). Many traders also call this pair the 'Loonie'. Any investor who carries out currency trading activities in binary options will look at the market price of the pair that he/she wishes to trade, after putting together a thorough USD/CAD forecast. A market rate for the USD/CAD pair of 1.0734 means that it takes 1.0734 Canadian Dollars to buy 1 U.S Dollar. One of the most traded currency pairs in Forex and binary options, this pair is therefore said to be very liquid. Factors which ordinarily affect and influence the USD/CAD pair include the interest rate contrast between the U.S federal reserve and the Bank of Canada. The U.S Federal Reserve’s influence in affecting this currency pair is strong enough. What it can do is take a decision to move in a particular way and alter the open market with the intention of bolstering the U.S dollar – thus making the pair’s market value rise. Since 2002, the USD has seen the CAD systematically rise against it – the Canadian currency has also been rising against other currencies, given that it is a petrocurrency (a currency used to buy oil) and that Canada is a major oil-exporting country. Currency trading in regards to the CAD is to be approached with cautiousness because of its volatility caused by the volatile worldwide oil rates. 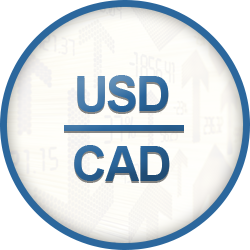 Gathering information through analysis is extremely important when carrying out currency trading on live markets, which is why this page offers you the resources needed to compile a comprehensive USD/CAD forecast.